Lain is currently completing his Ph.D under Bill's supervision on his project 'Diversity and habitat use of medium and large-sized mammals across oil palm dominated landscapes in the Llanos region of Colombia". 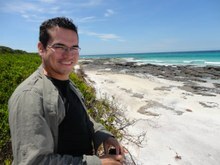 He is interested in applied ecology, conservation biology and wildlife management, with a particular focus on mammals and in the effects of human activities on biodiversity in the tropics. However, he is open to address questions in different taxa and habitats, as long as its aim has an implication in conservation. Betsy Yaap began her PhD at JCU in September 2010, with a keen interest in exploring how oil palm and acacia landscapes can maximize their conservation value. Previously positioned as a Senior Consultant with Daemeter Consulting in Bogor, Indonesia, she worked with industry and NGOs on High Conservation Value (HCV) assessments of oil palm and acacia license areas, delineating land areas to be maintained for conservation and advising how to manage them. Her PhD is an extension of this work, wanting to investigate whether so called ‘best practice’ wildlife management recommendations for plantations – namely maintaining riparian buffers, corridors and forest fragments – are indeed working. The broad objective of Rebecca's research is to analyse landscape transitions in Southeast Asia to determine the conditions that can be altered to deliver better environmental and social outcomes. She will evaluate two landscapes in Cambodia; the Northern Plains and Keo Seima Wildlife Sanctuary to determine the impacts of industrial agriculture and infrastructure on livelihoods and the environment. This study will be collaboration between James Cook University and the Wildlife Conservation Society (WCS). She aims to identify leverage points where interventions would optimise conservation-development trade-offs throughout the landscape-transition process and contribute to broader research on reconciling long-term development and environmental challenges. Gabriel started off as a Marine Biology graduate from the University of Papua New Guinea and ventured into marine pathology focusing prawn pathogens (Hons) in the waters between the Gulf of Papua in Papua New Guinea, and the Gulf of Carpentaria in Australia. He then went on to work for the Roger Williams Parks Zoo as a research assistant, focusing on home ranges of the Huon tree kangaroo on the Huon Peninsula in Papua New Guinea, obtaining a Masters in the process. While working in that particular part of the world I realized that the greatest threat to wild populations of Huon tree kangaroos were traditional landowners (hunting). Therefore his PhD aims to understand the dynamics of hunting across that particular region (Huon Peninsula).